Well where did those two weeks go holidaying in Cuba. I took my traveling rod there hoping to get at some fishing, however the area I was staying had few fish in the sea. The people are so poor they tend to over-fish the sea for food. They will take any size fish. Each morning I would wander down to the beach looking for any activity. 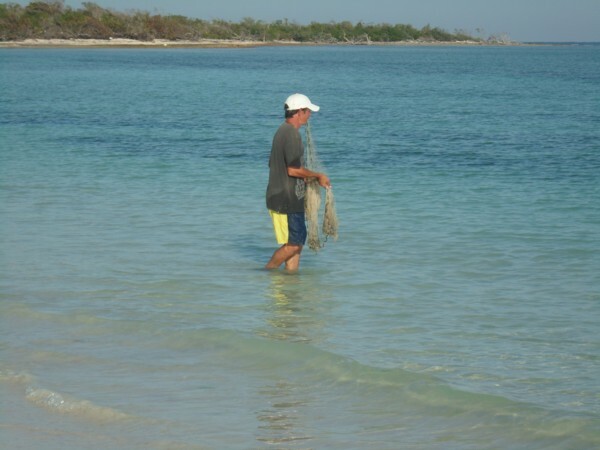 The only activity I came across were a couple of guys with nets each morning catching the food for the day. The holiday was great though the Cuban’s are such a friendly lot and have a wonderful smile for all. Me and the better half were supposed to fly up to Havana for a couple of days which normally takes about an hours flight. Unfortunately for us during the morning the plane broke down so that was our lot. Plan B was not quite so bad, swimming cool beer and good food. We need to go again to sample the delights of Havana. We did manage to get around a fair bit with the highlight being taken through old villages and sugar cane fields on an old steam train built in 1897 I think it was. There were several working the line’s. They were imported from the USA and rebuilt in Cuba. 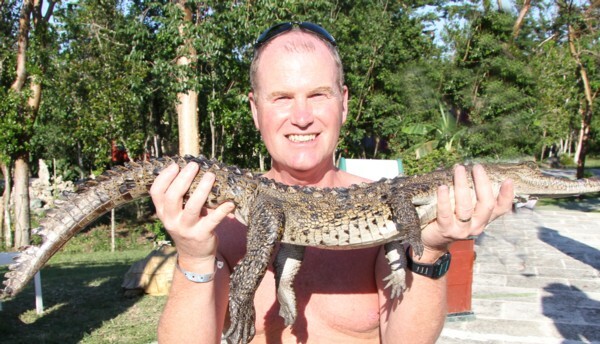 I did mange to hold a new pb alligator of I guess about 15lbs or so. A great holiday and place to visit. What a shock arriving home on Weds with the temperature not getting above 2c. So from 30c to 2c it took some getting used to. A quick look around at the EA river level web site showed the rivers to be dropping. Sure enough a few phone calls to mates revealed that we have had some rain but the rivers were clearing well. So being a bit jet lagged on Thursday, I decide to fish on Friday. I just couldn’t make my mind up, perch or chub. The forecast was for cold weather for the next 6 days or so. This would further improve the river for chub. Therefore next week would be an even better prospect for some trotting. So perching it was. My mate Andy had still been out a couple of times and caught another 3lber and a lovely pike on Chew of 27lbs, so he was very happy indeed. So Thursday after doing the grocery shopping it was off to the Keynsham Tackle to get some maggots. The Bristol Avon runs very close to the shop, too close a couple of times this year due to the floods. It looked wonderful that green/blue colour with lots of clarity. I was still wavering chub or perch! PERCH was my final answer! So Friday I was still a little jet lagged and didn’t arrive on the fishery until 9.30am and only me fishing. 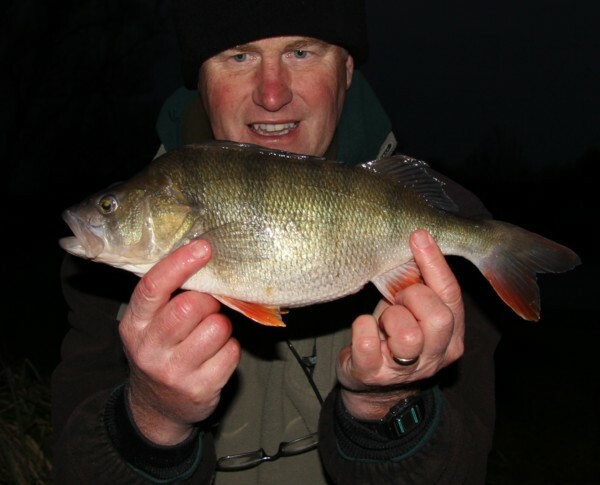 A quick chat to the guys revealed that a few big perch had been out and that they were starting to get plumper with spawn. So off it was to the swim. There was a driving easterly wind with the odd snow flake falling. I didn’t fancy facing the wind so I settled on a swim half way along the lake. I needed the umbrella up to protect me from the wind. I was using jumbo prawns dyed red for extra attraction. Also used was some loose maggots and smaller pieces of prawns fired out via the pult as an attractor. With the lake water so cold I didn’t want too much loose feed around as I thought not much would be feeding. Rods were the normal Fox duolight with quivers inserted. 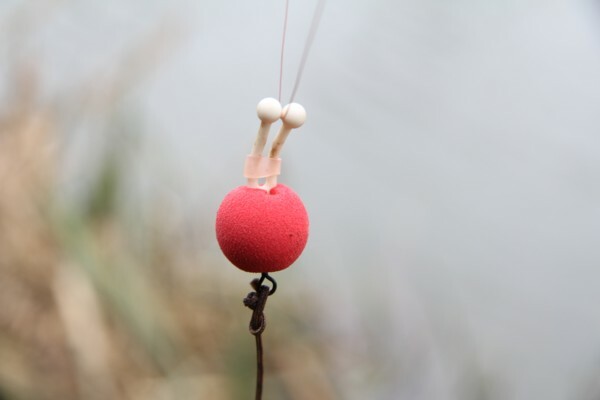 I just think that with these then there might be less resistance when the perch take the bait and the quiver might just give me an extra advantage. Well as the day wore on I was getting more and more line bites. The bobbins would rise up steadily, but then drop again. 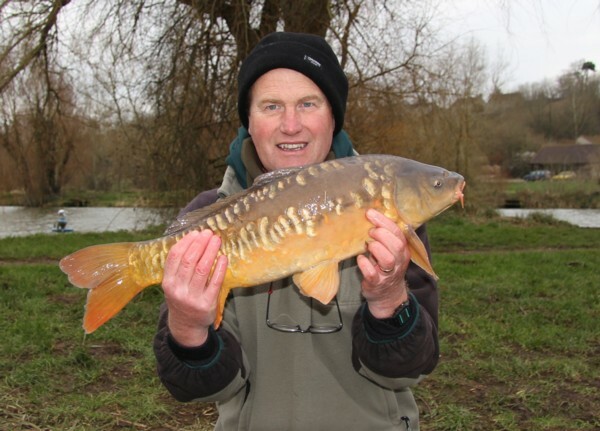 A few times the bobbin would shoot up very quickly followed by carp taking line from the reel. Having light rods and line this can be a pain in the behind playing these larger fish. Still it aways saves a blank. At about 2pm another perch fisher came along. He too like me would like to fish the river but this is a good time for the perch. He said that the last week had been very difficult for perch on the lake and that he had even blanked. So it didn’t fill me with great confidence. During the day I had a couple of visitors to the swim, one pair of very hungry black birds. Plus a lovely little robin that devoured all the maggots that I spared him. Then a pretty little wren kept coming back for more. 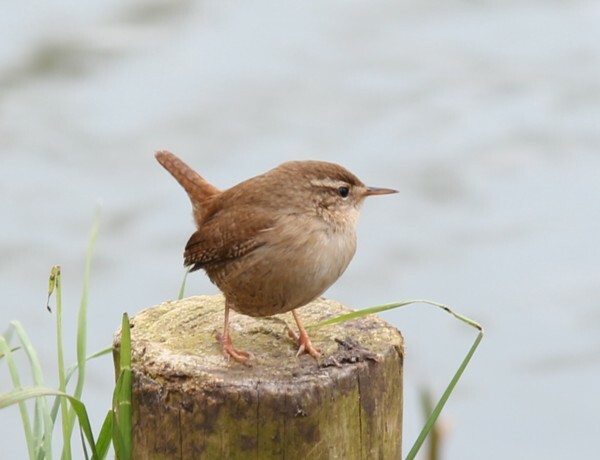 Now wrens tend to be nervous of humans, however it must have been hungry and I tamed him with maggots. I tend to recast every hour or so to make sure that there are no tangles etc, but if truth be told it’s because I needed to do something between bites. As the afternoon journeyed into twilight I knew it was just a matter of time before the perch would move on the prowl. Then it happened the bobbin slowly moved in a steady upward direction and the fish took about 3ft of line before the bobbin dropped off. I gentle strike of the rod saw me playing something very different than a carp. The jagged lunges from the fish was a give away that I had indeed hooked a perch. The fights are never spectacular but it’s still exciting to see how big it is as you bring it near the net. It looked a disappointingly 2lb fish. Which when weighed was about right 2lbs 1oz. It was carrying some girth too so it looked to be filling out. Sadly that was it for me. The other perch angler didn’t have a touch which is very surprising for me as he fishes it more than most. So my wait for a 3lber continues. 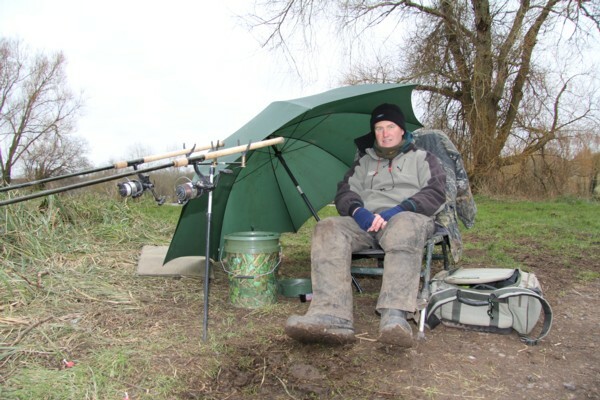 So next week it looks like I’ll be on Stour for a couple of days fishing for the chub. Can’t wait really. This entry was posted on Saturday, February 23rd, 2013 at 11:16 pm	and is filed under Uncategorized. You can follow any responses to this entry through the RSS 2.0 feed. Both comments and pings are currently closed.